Home 4Club Records Zappel Nuss EP out now! 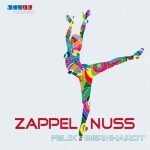 Zappel Nuss EP out now! Out now exclusive on Beatport! 4Clubrecords presents with the 4CR062 a new release from Felix Bernhardt. The typical Bernhardt sound on this “Zappel Nuss” is a framework of thick and wired sounds, programmed in dark Groove sequences. This building is based on a sonic bass- bunker, which delivers tons of baselines to the dance floor. Mr. Bernhardt at his best. Get your copy now!